Savvy technology vendors know the trend, CIOs and CTOs are laser focused on digital transformation projects that will fuel enterprise growth, enabled by new online business models and other strategic imperatives. That said, IT infrastructure investment within many markets is still relatively flat. According to the latest regional market study by International Data Corporation (IDC), IT spending in Western Europe will total $453.8 billion in 2017 -- that's a 2.7 percent increase compared with 2016. IT spending in this market will continue to grow at about a 2 percent five-year compound annual growth rate (CAGR). Investments in new technologies -- such as augmented reality and virtual reality (AR/VR), artificial intelligence (AI) and cognitive computing, robotics, 3D printing, and Internet of Things (IoT) -- will drive demand as companies strive to innovate, improve customer experience, and streamline business processes. 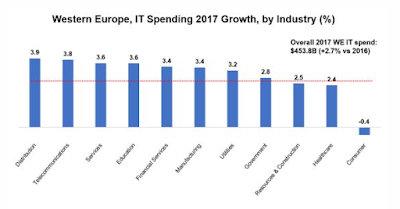 During 2017, consumer, banking, and discrete manufacturing sectors will be the vertical markets with the biggest IT spending -- accounting for over a third of overall Western European IT spend. IDC forecasts that retail, professional services, and telecommunications will be the fastest growing markets in 2017, and they will continue to lead in 2018. In the long term, professional services, retail, and process manufacturing will generate the fastest 2017–2021 CAGR. "Traditional technologies such as mobility, social media, cloud services, and Big Data helped companies to introduce change and move from a traditional approach to a more digitized one," said Andrea Minonne, research analyst at IDC. With next-generation technologies, many organizations will go the extra mile, move one step ahead of the competition, and fully embrace digital business transformation. This will be a win-win game, from which both businesses and their customers will benefit as progressive companies introduce a more advanced approach into their businesses, optimizing processes and bringing extreme automation. On the other hand, according to the IDC assessment, the large amount of data that customers produce will allow companies to understand what they must focus on, enabled by cognitive analytics solutions. This will result in more personalized products or services and increased customer satisfaction. In the latest market study, IT spending forecasts are segmented into IDC's 20 standard vertical markets: banking, insurance, securities and investment services, discrete manufacturing, process manufacturing, retail, wholesale, professional services, personal and consumer services, healthcare provider, transportation, telecommunications, media, utilities, construction, resource industries, federal or central government, state and local government, education, and consumer services.